Sandra attended yesterday, in Los Angeles, a Q&A for Bird Box during Deadline’s The Contenders panel. 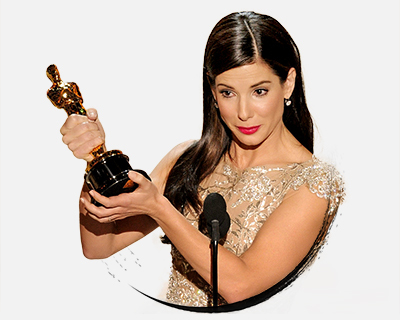 Deadline – While Sandra Bullock would eventually fall in love with Bird Box—a Netflix horror-thriller based on a novel by Josh Malerman and directed by Susanne Bier—the Oscar winner had quite a different reaction to the material in her first interaction with it some years ago. Sandra attended last night at the SAG-AFTRA Foundation a Q&A for her next movie Bird Box, alongside her co-star Trevante Rhodes. Check some images in our gallery. ‘Bird Box’- Check the first creepy trailer! 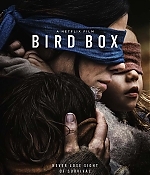 Netflix just released the first trailer for Bird Box, directed by Academy Award winner Susanne Bier, known for the Oscar-nominated “After the Wedding” (which introduced much of the world to Mads Mikkelsen). 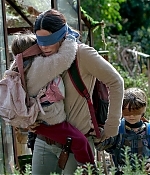 “Bird Box” is based on an post-apocalyptic book and centers on a woman and a pair of children who are blindfolded and make their way through a dystopian setting along a river. “Bird Box” is available on Netflix and in select theatres on December 21, but will premiere at AFI in November first. 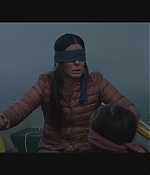 People has the first look of Sandra Bullock in Bird Box, that will be released next December 21. The trailer, as Netflix social media is announcing, will arrive tomorrow! After successfully pulling off a heist in this summer’s Ocean’s 8, Sandra Bullock and Sarah Paulson are back together for Netflix’s upcoming thriller, Bird Box. Paulson and Bullock play sisters in the movie who are suddenly thrust into an mysterious apocalyptic environment where people around them start to behave abnormally for seemingly no reason. But even though the plot was darker than their previous movie, Paulson, 43, and Bullock, 54, still managed to bring comedy to the thriller, out Dec. 21. Luckily for Bier, Paulson and Bullock already came in with a chemistry that will have viewers laughing within seconds of their first scene together. But the movie is still very much a suspenseful thriller, filled with the mystery of what exactly is causing people to lose their minds. For reasons we won’t spoil here, people learn they must wear blindfolds when they go outside — and Bullock took this seriously. Last week Sandra was, alongside her Ocean’s 8 co-stars Cate Blanchett, Sarah Paulson, Rihanna, and Helena Bonham Carter at The Graham Norton Show.